All transactions are safe and secure with a reliable history in online purchasing behind each of our associates. Buy the Speed Racer Characters t-shirt to own Speed Racer clothing and merchandise. This 80s retro Speed Racer t-shirt features a design on the front that includes the main character, the Speed Racer logo and the entire racing team. This includes Trixie, Pop's Racer, his mom, his brother Spritle and the chimpanzee Chim-Chim. Beneath the logo and Speed himself, we see his racecar, the Mach 5, intensely motoring its way toward the finish line. 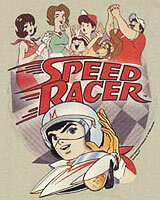 Wear this Speed Racer merchandise item the next time that you take out your girlfriend Trixie in your Speed Racer car. In addition to the Speed Racer Characters tee above, browse the Speed Racer Clothing Gallery for more apparel like men's and women's clothes, kids shirts or hoodies.